You all asked for a few tips/recommendations to help develop your creativity. So here are my top 10 tips. There is no doubt in my mind that I am not the perfect artist, or the person that should be even giving this advice out. I still have so much to learn from all of you. 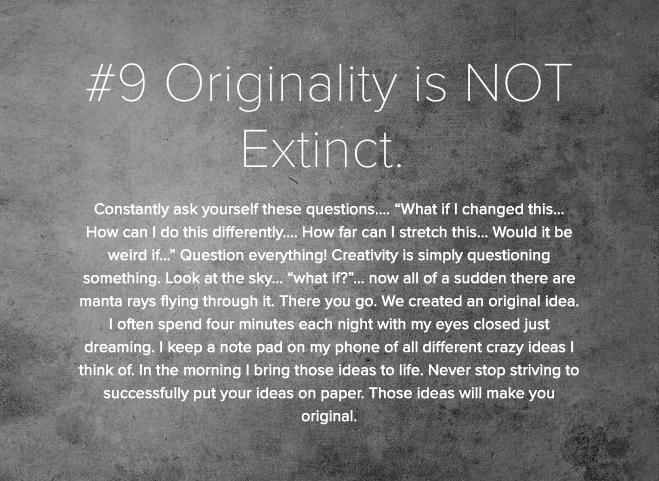 But here are 10 tips that I work on daily to cultivate my artistic abilities. Hope you enjoy & find this helpful. We decided to take a trip down to Henderson, NV to see my family for the 4th of July. Growing up in Henderson, the heat never affected me, but now I really realize how intense it is! So most of the week was spent in the pool, cooling off. But early on Thursday, Dylan and I decided to go check out Ugo Rondinone's large scale art installation called "Seven Magic Mountains". This installation is near the Jean Dry Lake Bed off Interstate 15 & it is a quick 10 miles from Vegas! The installation is a series of brightly colored boulders stacked over 30 feet high. The installation will be coming down on May 11, 2018 so I felt I really needed to check it out! Plus, we all know I would go through any heat for some rainbows! Wanted to update you guys with my progress on my most current commission piece of the Tuiaki family. This piece has been a long time coming, and I ain't kidding! This realistic family portrait measured 36x48 inches and is the largest commission I have ever done. Wanted to show you all a few photos from the journey! Took a quick tour of graffiti alley which is in downtown Salt Lake City. Dylan and I love exploring our city bit by bit & we always find new adventures around every corner. We would definitely recommend this little spot to everyone! Took a quick trip up to Sundance, Utah with my husband, brother, and sister-in-law! It was a fun weekend getaway, and we have some amazing pictures to prove it! We are so blessed to have the best family. As I was scrolling through Instagram the other day, I found this beautiful photographer's work out of Utah. The photos had this incredibly huge field of poppies, and I was determined to figure out where this was. I found out- Mantua, Utah was only a quick hour away from Salt Lake City. My cute husband woke me up in the morning, "Babe, if we are going to find these poppies, you gotta get up!". He is just the cutest. So off we went, and found this beautiful field. We stopped on the way home for my favorite candies at Idle Isles Candy Shop, and were home before dinner. Life is just complete bliss! Another year, and another girls trip! This year we decided to take it to the Czech Republic. I have already been to the Czech Republic, but since it has been a while, it was so nice to refresh my memory and see the country again. This trip was too fun. We spent most of our week in Prague, but also took a little detour to Boleslawiec, Poland to do a little pottery shopping. Here is an overview of our trip! 1. GO DURING EASTER. Easter is the biggest holiday in Europe. Europeans decorate the outsides of their houses by filling the trees with hanging eggs. All major cities have multiple huge Easter Markets to celebrate that are filled with delicious food, finely decorated eggs, and adorable petting zoos. 2. Plan ahead. There are so many hidden gems in Prague that would definitely have gone unnoticed if it weren't for planning. We planned the sights we wanted to see out before we arrived so that we wouldnt miss anything. Be sure not to overplan and leave some time to wander! 3. TRENDELNIK. Seems crazy, but eat as much Trendelnik (Pargue's most famous pastry) as you can! You will regret not having multiple when you get back to the USA. Plus, calories don't count when you are in Europe.... right? 4. Take a day trip, and stay overnight in Poland! We rented a car and drove to Boleslawiec, Poland. Boleslawiec is a town thats primary purpose is Polish Pottery. Perfect for us girls! I grew up eating off of Polish Pottery, so now that I have a home of my own, this trip was a dream come true. Not interested in shopping for pottery? Plan on going somewhere else, there is not much to see but plate in Boleslawiec. Also.... pack an extra suitcase... or try and carry on your pottery. Otherwise you will come home to beautiful broken pottery :( Luckily all my piece survived! 4. Bring extra spending money! There are so many amazing things you can spend your money on when it comes to Prague (& Bolseslawiec, obviously..) but I would say that my favorite purchase while I was in the Czech Republic was jewelry. *See #5 for details. 5. Garnets!!!! Prague is known for their red garnets as the gem of their country! They are sooo much cheaper in the Czech Repub. then in the US. Also, Prague is a city of history.... check out antique stores to see beautiful pieces from history. I got a diamond ring from 1900's and a collection of vintage stamps as a keepsake of my journey. Astronomical Clock (take the hike or elevator to the top! ), Take a sip of some lemonade on the rooftop resturant of the Du Prince Hotel overlooking Old Town Square, City tour by Old Classic Car, Stop and Sing at the Lennon Wall. Overnight stay in Poland, Rented a car (with lots of trunk space haha) and drove using our TomTom to Boleslawiec. My mom and I were navigators.... which proved to be VERY challenging since the main route was under construction. But we got there! Shopping was incredible. My favorite store was Manufaktura. Stay the night in Boleslawiec. We woke up with no buyers remorse from all the money we spent, so hit a few shops on the way out to Kutna Hora. In Kutna Hora go to the St. Barbara's Cathedral, Sedlec Ossuary (AKA Bone Church), Along the way- stop to get a beautiful photo of the tulip trees that are blossoming! Go inside the St. Nicholas Cathedral, and stop by the antique shop near by! Head to the Petrin Tower, and take the cable car up! Climb to the top of Petrin Tower for an amazing view. Walk along Charles Bridge back to the hotel, and stop to ride a 4 person paddle boat along the river. For Christmas, we decided to leave the presents at home, and take a trip to Mexico for some warmer weather. It was the perfect time of year, and my pasty skin needed a tan! We spent a few days in Los Barilles, Mexico- which is mainly a fishing town. And then headed to Cabo San Lucas. 1. Don't spend too much time in Cabo! Cabo is a party scene. If that what you are looking for, go right ahead.... but if you want a fun and true Mexican vacation, head to a small town like Los Barilles. I personally wish we would have stayed in Los Barilles for our whole trip. 2. Take a risk and go fishing! Our family loves to fish, and my husband lives for it! So, it was expected that we would fish our hearts out. & we did just that! Mexico has amazing fishing, and it doesnt cost a whole lot to charter a fishing boat! Make sure to keep some of the Dorado and Tuna you catch for some fresh Ceviche at the hotel. All you need to do is give the cooks the fish, and they will make you the Catch of the Day. Nothing better than eating something you know was caught a few hours before! 3. Eat wayyyy tooo many tacos! Don't be afraid to try restaurants, and experiment with new food! While you are out, stop at a grocery store and try some Mexican treats and a Mexico coke in a bottle! 4. Glass Bottom Boat in Cabo. Be very careful when ordering a boat in Cabo to head out to Lovers Beach. There are a lot of scammers, and they will take your money, and give you exact NOT what you asked for in return. So just make sure you are smart and real with the people you buy from. Bring googles and flippers to Lover's Beach to do a little snorkeling. The current is strong, so be very careful... but if you are a strong swimmer, it is so fun to see all the fish! 5. 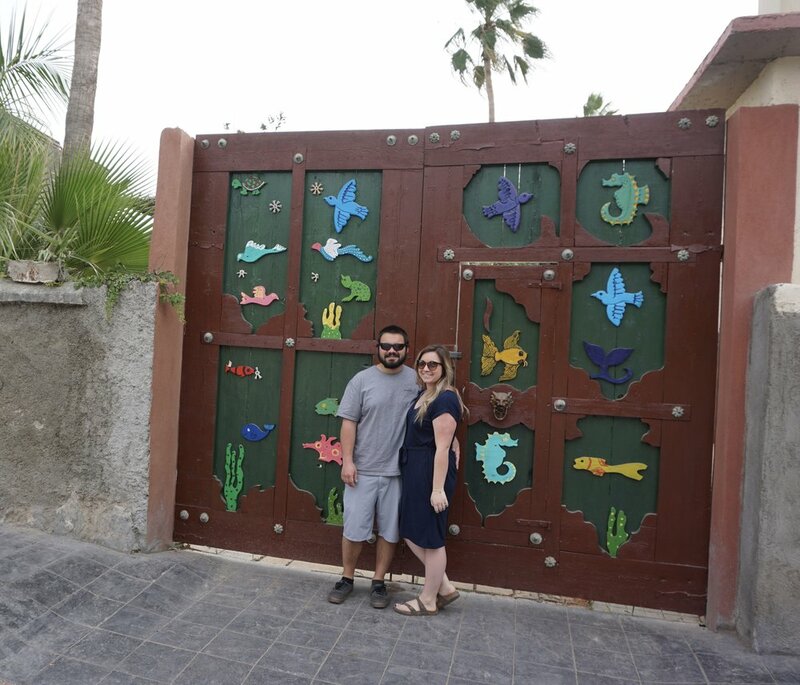 Take a day trip to Todos Los Santos, and if you can plan ahead, release some turtles! We didn't get a chance to, bummer! Every year, the girls in my family plan an epic girls trip. In 2016, we decided to travel to India! I wanted to share some photos and our basic itinerary with you, just to inspire you to travel to this incredible country. 1. Plan the timing of your trip wisely. India is BEYOND hot and humid. Make sure you do not travel to India during their mid or late summer. We traveled in April, it was 100 degrees daily with 50-80% humidity. It was blazing hot daily. 2. Pack lightly! You can plan the cutests outfits ever, but at the end of the day, you just want to be comfortable. Dresses are great for in india, because they are breathable and you won't have to dress up when going into any temples. Be respectful of their culture by being modest. No booty shorts, ladies! 3. Bring some comfort food. We were in India for 8 days.... needless to say.... we got tired of the cuisine. Bring some snacks for when you need a step away from the spices and curry! 6. DO NOT DRINK THE WATER. I stayed far away from any tap water, and still got sick. Take antibiotics daily while travelling. But at the end of the day, expect your digestive system to be completely wack after and maybe even during your trip. 3/4 of us girls got some sort of sickness while traveling. 7. Book a personal tour guide. We traveled with a tour guide, who hired a driver for us the entire week. It was incredible and well worth the money. 8. Embrace the culture. People may say that it is offensive to see an Non-Hindu person rocking a bindi, but that is sooooo not true. The indian people love when you embrace their culture. Their perspective on you will change, and they will start smiling instead of glaring at you! 9. If you are a younger girl traveling to India, beware that you will be asked to take dozens of photos with teenage boys. They are not being gross, or crude, they just think of American girls as celebrities. So have fun with it! And remember... their cameras are always watching you! 10. Go jewelry shopping! Your wallet may not like it, but it is worth it. The gems and gold in India are amazing prices, and you can always bargain. I had two gold rings made for me at a jewelry shop... we picked them up the following day and they were beautifully made! My only regret is that I didn't make more! 5 hour drive to Jaipur, Ride a Camel, Jal Mahal Water Palace, See a Bollywood Film, Umaid Bhawan Hotel. Get a Henna Tattoo, Morning Flower Market, Jantar Mantar, Go Inside Palace of the Winds. On our way to Ranthambore, we stopped at the Galta Ji Monkey Temple. Warning, monkeys can be aggressive! 5:30 AM Tiger Reserve Tour *Yes we saw a wild tiger!!! *, and see the Black and White Temple (Even though its super colorful....). Drive to Agra- 5 hours. Upon arrival see the Little Taj, also called the Jewel Box. Drive to the Back of the Taj for Sunset. 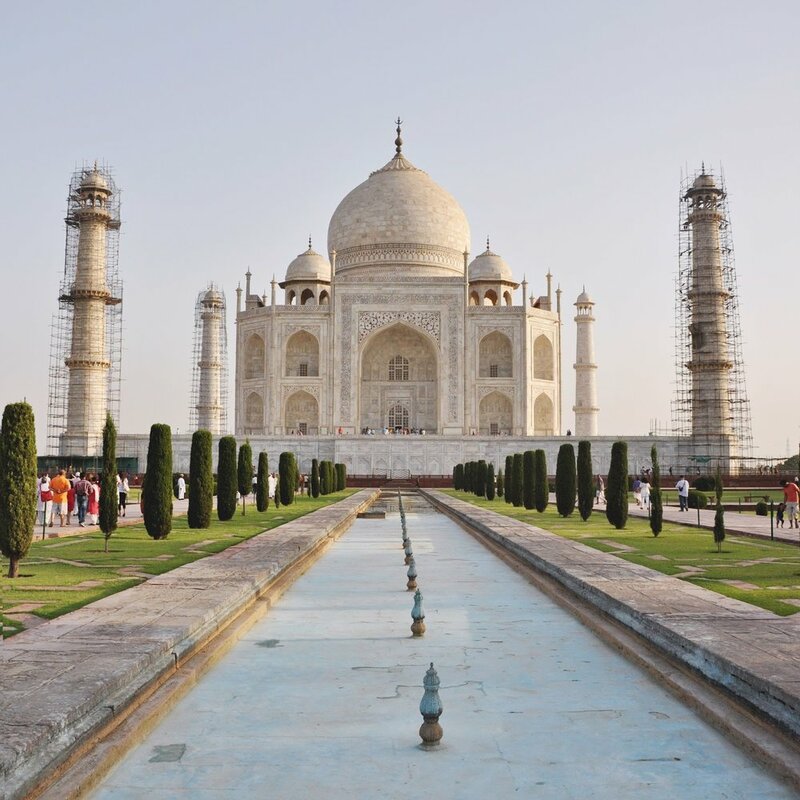 Tour the Taj Mahal, wake up early to beat the crowd! Then after, tour the Red Fort. View all the artwork by clicking on them! This last year, my Drawing 2 students were given the choice to participate in an unbelieveable project. As a class, we decided to sign up to be a part of The Memory Project. The Memory Project Foundation is a non-profit organization who sends students all around the world photographs of youth in various locations that have been affected by things like poverty, parent loss, neglect, etc. With the photos you are given, students then create a portrait of these youth from across the globe. 24 of my students decided to participate and around 21 of my coworkers students participated as well. Our school (more like me.... haha) raised the money to participate in this project ($15 per person). We were sent photographs from youth living in Bolivia. My students were thrilled to know that their artwork was going to be sent to these kids across the globe. I talked to my students about the meaning of this project a lot. We talked about what we are blessed to have, and what they may not have. We talked about how love is the ultimate healer. We decided that we wanted each of the kids we were drawing to know their individual worth, their beauty, and their value. I found that my students began to work harder, because they knew that they were making an impact. They started looking outside of themselves, and started thinking about the child they were drawing. Students were creating portraits that had deep thought, beautiful meaning, and humbling symbolism. We worked on these portraits for only two weeks. This was SO quick. The students worked hours outside of school to complete the pieces in time for our huge art show that we had decided to put on. We contacted news stations, the newspaper, as well as online journals to inform them of our event. We were so surprised when three different media specialist showed up and filmed our art show. I am so thrilled and proud of each individual student that participated. I am even more touched by the beautiful notes they wrote to the kids in Bolivia. They were humbling to me, and heart-warming. These Bolivian kids truly do have my students love, and no separation of continent could change that! In May, each portrait was hand delivered to the kids we drew. We were able to see their reactions, see their living conditions, and see their gratitude. My students were thrilled. Just wanted to welcome you all to my new website featuring all my artwork. On this site you can contact me about commission, purchase orginial artwork (not prints! ), and recieve creative inspiration! Thanks for joining me!